As we head into fall, I am both excited and bummed out. Fall means sweaters and hot cider; it means hot soups and comforting stews; it means my apartment doesn’t overheat when I go to bake a pie. But fall also means no more summer tomatoes, goodbye stone fruit, so long summer corn. If you’re anything like me, you love sweet corn in the summer. It’s great for soups, salads, and just on the cob. I’ve even made corn ice cream last year. And while there is always corn available in the freezer section of our supermarket, I have found, in the past, that it tastes totally bland. I can’t taste the summer sweetness, no matter how generous a knob of butter I apply. 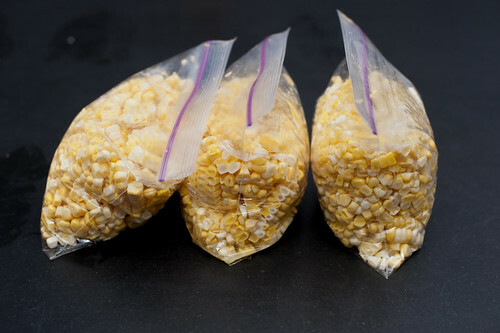 Last summer, I took a few ears of corn, cut off the kernels, and froze them in a small Ziploc bag. And then forgot about the bag completely. Sometime in January, while cleaning out my freezer in preparation for Andrew’s move-in, I found the bag of corn in the back. I warmed it in the pan with a bit of butter and salt and had the most amazing dinner treat that night. This year, I’m freezing 20 ears of corn to last me through the fall and early winter. It’s really all that my small apartment freezer will allow, but if you have more space, or another refrigerator/freezer going on in your household, consider preserving more. I put the kernels in small bags, so each portion is contained, squeeze out extra air, and freeze. The sandwich size bags fit about 3 ears of corn. That should be enough as a side dish for two people. Of course, you can scale up more, should you need to. Some people parboil their corn for 1 minute before freezing – it should slow down the conversion of sugar. I’ve been cutting and freezing without any problems in the past. If you want to parboil, go ahead – just cook corn for 1 minute before plunging it into an ice bath to stop the cooking process. Here’s to summer memories in a few months! I too feel a mix of sadness and excitement for the end of summer and the beginning of fall. 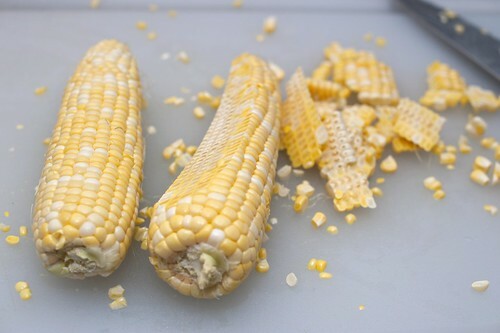 But, what better way to hold on to a bit of summer than to freeze delicious sweet summer corn – my favorite! Thanks for the tip. Thanks for the reminder – I did one bag last year and it was delicious. The corn has been so amazing this summer – I need to do some for this winter. Now I’ll have to excavate some space between the strawberries and currants that are already staking out space in the freezer. Great tip and when I read your post I though, “why didn’t I think of that? ?” because I do the same thing with berries. Raspberries and blackberries and blueberries are among my favorites but can be rather pricey when not at the peak of their season. The trick is to rinse them, let them air dry, and lay them flat in a single layer on a pan or dish. That way the freeze separately instead of getting mushy when you let them thaw. Once frozen, I put them in ziplock bags. They’re great for adding in desert recipes all year long. Becky Sanchez – glad you find it useful!